potentially nervous: the almighty NIBSilicious testing for snow leopard on a 30 inch monitor...wooOOO! should be ready any minute now. the almighty NIBSilicious testing for snow leopard on a 30 inch monitor...wooOOO! should be ready any minute now. okie doke artichokes, snow leopard here we come! with the help of our dearly beloved nibs we have finally gotten the snow leopard version scaled down to a reasonable size. any minute now we should be letting those of you with snow leopard have your way with us. now there does seem to be some confusion as to what it is exactly we are selling here. 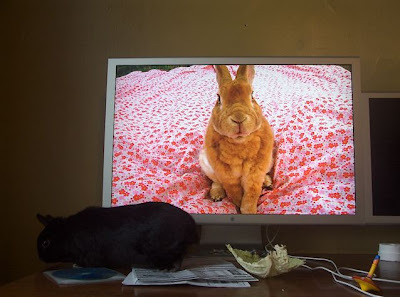 this screen saver has loads of bunny images and they scroll through your idling computer gracefullly, cross fading into one another. i have had more than a few people tell me they are already using a bunny photo as a screen saver but that another one would be nice...this isn't just another ONE and it's not a STILL screen saver. think of it more as moving slideshow. any other confusion out there? you send your questions right to me and we will get to the bunny bottom of it asap. It's true. The new version works beautifully with Snow Leopard. At last!!!!! !